IDrive Express™ speeds up your data retrieval from the cloud account via physical shipment of temporary storage device. IDrive sends the most recent version of your data in encrypted format to ensure that your files are safe during transit. Using the IDrive application, you can easily restore your files in original format. 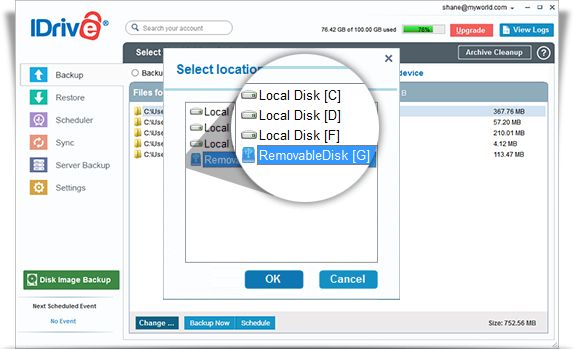 Fill in the hard drive shipment form available at https://www.idrive.com/idrive/home/hardDrive and specify the files and folders you wish to restore. We will ship your data via a USB hard drive. Once you receive the hard drive, connect it to your computer using the USB cable and launch the IDrive application. Next, go to the 'Restore' tab and choose Local Device in 'Select files / folders for restore'. 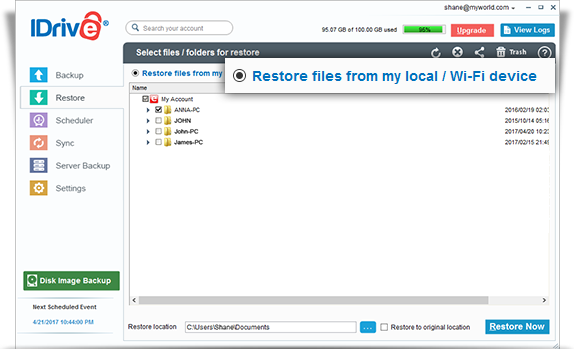 Select the files to be restored, and click Restore Now. Note: Once you have restored all your files, you Must ship the hard drive back to IDrive.